One of the requirements of the robot for Mechatronics is that it have optical sensors on the bottom to detect black tape on a white background, for detecting the edges of the field, alignment marks for the Ren-ship target, and other marks on the field that seem to be there just to be a nuisance and make the state-machine design harder. 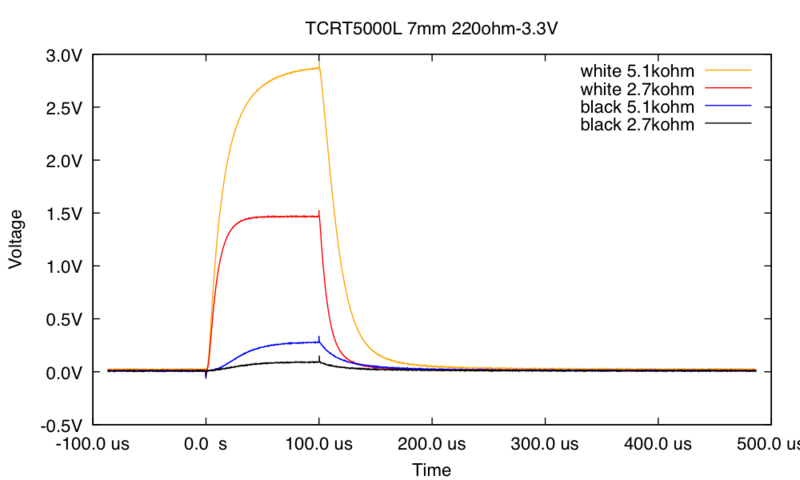 We were issued a number of TCRT5000L reflective sensors, which consist of an IR emitter and a phototransistor in a plastic package that is optimized for a surface 2mm away. Although the sensors are designed to snap into PC boards and could probably be snapped into carefully sized holes in MDF, I’ll be mounting them on perfboards, which will be screwed onto the top of the baseplate of my robot, with rectangular holes in the MDF for the sensor to poke through. They’ll barely poke through (6mm high — 5mm MDF), which means they’ll be about 7mm from the floor. At that distance, the collector current is about half what it would be at the optimum distance. The MDF provides some extra shrouding from stray light from the sides, which should help with detection. I’m planning to turn the IR emitters on only when I need to read the sensors, to save power and to allow synchronous detection of reflectance (looking at the difference in light levels between the IR emitter being on or off). By keeping the duty cycle below 50%, I can run the IR emitters up to 50mA, though I may not need them to be that bright. If I switch on 5 IR emitters at once, at 50mA each, I’ll be using 250mA, which is the limit for what I could get from the Teensy 3.2 3.3V regulator (rated for 250mA, though that’s a thermal limit, so 500mA may be available for low duty cycle) and far exceeds the 100mA limit for Teensy LC or Teensy 3.1 boards. I will be using a 5V regulator to power the Teensy boards, so I could use the 5V supply to power the IR emitters also. If I use only 10mA per IR emitter, I only need 50mA total and so could power off of either 3.3V or 5V. For 50mA at 5V, I’d need a current-limiting resistor of ≥(5V–1.2V)/50mA=76Ω, so an 82Ω resistor for 46–48mA would work. For 10mA at 5V, I’d need ≥(5V–1.1V)/10mA=390Ω, and for 10mA at 3.3V, I’d need ≥(3.3V–1.1V)/10mA=220Ω. There are 3 wires to each sensor board, but only the current output is unique to the board—the IR emitter connections can be shared among all sensors. 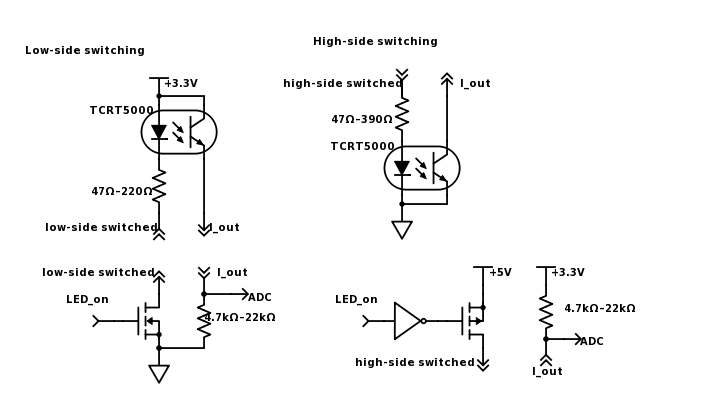 Low-side switching only requires an nFET, but the power connection for the IR emitter is limited to 3.3V. High-side switching keeps the 3.3V power line from being routed near the motors, but requires a 5v-powered inverter to get a sufficiently large voltage to shut off the pFET. The expected current from a white background @7mm is about 400µA for 10mA input or 2mA for 50mA input, assuming VCE is in the active region (above about 0.5V). If I’m looking for a 1V swing between dark and light, I’ll want about 2.5kΩ for the sense resistor for a 10mA input and 500Ω for a 50mA input. I did a couple of tests with the TCRT5000L using the low-side switching configuration, with 3.3V and a 220Ω current-limiting resistor. 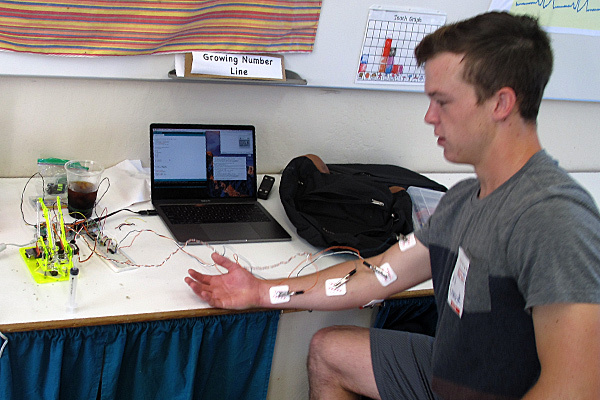 I was doing the tests in a well-lit room (my breakfast room on a sunny day, but without direct sunlight in the room), so the background light is probably brighter than the robot will ever have to deal with. I used one of the wheels from the MockRobot to be the target, since I could put a screw through the axle hole to get a more-or-less consistent spacing from the sensor. I adjusted the nut so that the spacing was about 7mm from the sensor, but the angle was only controlled by eyeballing the levelness of the target, so probably varied by ±10°. I did not have any of the black tape that was used on the fields, so I substituted black electrical tape, which I think may be slightly more reflective. I initially tried 2.7kΩ as the sense resistor, but after seeing the voltage range for that, I upped it to 5.1kΩ. With 5.1kΩ, the voltages when illuminated are very different between black and white—a simple digital input would suffice. The currents can be seen to be about the same, independent of the sense resistor, with the white MDF giving about 10 times current of the black electrical tape. The signal from background illumination is insignificant, though that might not be true if the IR beacon is lighting up the field. It looks like 10mA (measured as 9.65mA) is more than enough light for the sensors to tell black from white, and that the signal is strong enough that I don’t really need analog input or synchronous sensing for the tape sensors. If I get really worried about the digital signal in worst-case conditions (like too large a distance), I could increase the size of the sense resistor further. With a 22kΩ sense resistor, I get a very clean separation between white and black even at 1cm. I have to decide whether to pulse the IR emitters and wait at least 100µs before reading all the sensors, or just to leave them on all the time (at a cost of 10mA per tape sensor). If they are on all the time, I could use the 5V supply (with a 390Ω current-limiting resistor instead of a 220Ω one), and not worry about overloading the Teensy regulator. This could also simplify wiring, as the 5V regulator could be on the power board on the first level and the battery wiring would be limited to the first level. The Teensy 3.1/3.2 digital pins are 5V-tolerant, so I could even connect the phototransistor collectors to 5V and put the multiplexer on the first level using 5V power. I could then put the sense resistors on the tape-sensor boards and have three wires for each board: 5V, GND, and WHITE. I could use 3-pin male headers and standard Futaba servo cables to do the wiring. I ordered a set of servo cables through Amazon, but they are not expected to arrive for another 2–6 weeks, so aren’t going to do me much good.) I can make my own, but I’ve been having trouble lately with intermittent contacts from the crimp-on connectors and have taken to wicking tiny amounts of solder into the crimp, which adds a lot of time to making the cables. With the multiplexer on the first layer, the only cabling from the tape sensors to higher levels would be 5V, Gnd, 3 select signals, and the (now digital) signal for sensing the tape. The motors are also on the bottom level, and they would additionally need 2 wires for controlling each motor and 2 wires per motor for feedback from the Hall-effect encoders. This makes the total wire bundle from the bottom level up to higher levels be only 14 wires (5V, Gnd, 4 for tape sensors, 2×4 for motors), with none of the wires having high-current switching. The only high current wires are the 5V and Gnd wires, which may be feeding servo motors on higher levels—I may want a separate power wire from one of the switching regulators for powering servo motors on the higher levels, though. The Teensy LC is not 5V-tolerant, so if I used that for the main controller board, I would need to communicate a 3.3V power line as well for the phototransistors and the motor encoders. I think that I’ll simply declare that the main controller needs to be 5V-tolerant for digital inputs. [Update 2017 Nov 18: I soldered up one of the TCRT5000L circuits, so that I could do a little more testing and make sure that I had a layout that worked. It turned out that 22kΩ for the sense resistor was too large—at some distances the electrical tape reflected enough light to get above the 1.15V which is the guaranteed max VIL and maybe even enough to get to switch to high. I took out the 22kΩ and used a 10kΩ, and the problem with black reflecting too much light went away, but white still produced a very strong signal. I should be able to detect the white board reliably with just digital inputs out to about 1.4cm, much more than the 0.8cm clearance. 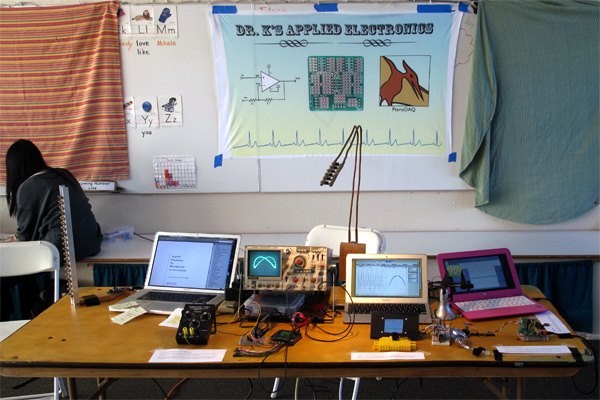 I’ve been planning since the Santa Cruz Mini Maker Faire to wire up an optical pulse monitor with a log-transimpedance amplifier as the first stage, so that I could use the pulse monitor in full sun or in a dimly lit room, with a dim green LED or with a bright infrared LED. The idea is to make the output of the first stage proportional to the log of the photocurrent, rather than to the photocurrent, then use a band-pass filter to get rid of the DC component and any 60Hz fluctuation, leaving only the fluctuation due to the pulse. , for some constant . If the illumination is constant or has only high-frequency components, then the bandpass filter will eliminate both and , leaving only the absorbance . I deliberately did not start working on it until I had finished my grading for the quarter, so only got it built last week, just before going to Montreal for a family reunion of my wife’s family. So I’m only now getting around to blogging about it. The base-to-emitter diode has a current that is exponential in the voltage, and the collector-to-emitter current is proportional to the base-to-emitter current, at least until the transistor approaches saturation (which starts around 10mA). The A1015 PNP transistor has a voltage proportional to the log of current, with about 60mV/decade. I did not use a unity-gain buffer when measuring the voltage and current, connecting the Teensy ADC channels A10 and A11 directly to the emitter and base+collector of the transistor. Measurements at less than 5µA were difficult, because the high impedance of the sense resistor made the ADC measurements inaccurate. The WP710A10F3C IR LED has a low forward voltage, and can be used from 100nA to 30mA, given that we don’t need high accuracy on the log function. We get about 105mV/decade, so it is more sensitive than the A1015 transistor. Note: I did use a unity-gain butter for these measurements, which allowed me to get down to about 50nA—still much higher than the photocurrents I observed in very low light. The IR LED has a wide range over which the voltage is the logarithm of the current, or . For 10nA, the equivalent gain is about 24MΩ, and for 1µA, the gain is about 240kΩ. For 10pA (about the smallest current I’ve observed for operating the pulse monitor in very dim light), the equivalent gain is 24GΩ. This amplifier uses only 3 op amps: a log-transimpedance stage with an IR LED as the impedance and two bandpass inverting amplifiers. The 330pF capacitor in parallel with the log-impedance is very important—without it I get very short glitches which the next two stages lengthen into long glitches in the passband of the filters. Making the capacitor larger reduces the glitches, but makes the corner frequency of the effective low-pass filter too low when light levels are very low, and the signal is attenuated. Any smaller, and the glitches don’t get adequately removed. I have tested the pulse monitor over a wide range of light levels, with a DC output of the first stage from 234mV to 1.033V, corresponding to photocurrents of 11pA to 463µA, a range of 42 million (7.6 decades). At very low light levels, the signal tends to be buried in 60Hz interference, but if I ground myself, it is still usable. 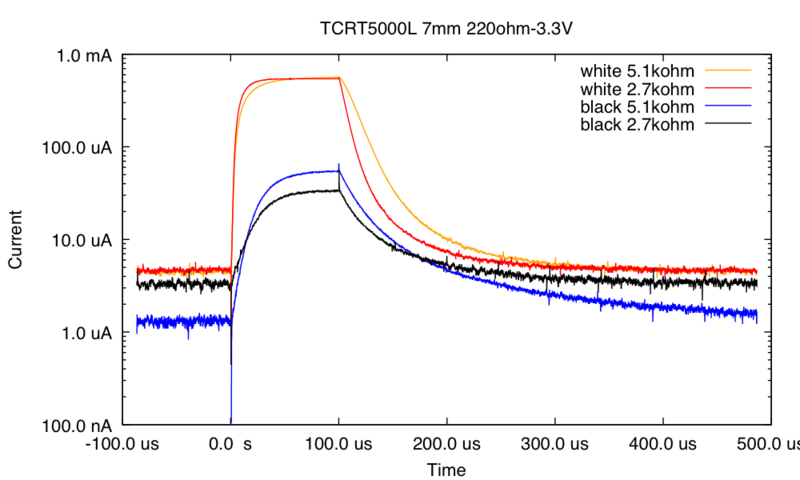 In very low light, the capacitive coupling of 60Hz noise buries the signal, but the bandpass filters help recover it. At high light levels, it is easy to get clean signals, as the 60Hz interference is swamped out by the large photocurrent. Note that the voltage swing is almost independent of the overall light level, as it depends only on the percentage fluctuation in opacity of the finger, which depends mainly on how much pressure is applied. If you get the pressure on the finger close to the mean arterial pressure (so that the finger throbs), you can get quite a large change in opacity—I’ve computed changes of 17% in opacity.